Is your site where and what you think it is? Surprise! Surprises do happen along the way, and as with all construction projects, the sooner you find them, the easier they are to address. Beautiful September Saturday morning, early, walking out over the Kennebec on the pedestrian walkway of Augusta’s Memorial Bridge. The bridge isn’t vibrating nearly as scarily as it had during the scouting trips. There’s a barrier between us and the cars and trucks, which is good because they’re whizzing by only a few feet away. I’ve explained to Sandy, the photographer, and Justin, her assistant, that we don’t have to use a ladder to shoot over the chainlink fence, and we don’t have to shoot through the holes. We can just shoot under the fence. PDT recently led green schools presentations for each of our two newest school clients, RSU 39 in Caribou and MSAD 75 in Topsham. The presentations were educational, inspirational, participatory, and the beginning of our green schools goal setting process for each of the projects. A green school is healthy, comfortable, energy efficient, material efficient, and easy to maintain and operate. A green school is located on an environmentally responsible site, is adaptable to changing needs, is safe and secure, and is a building that teaches. 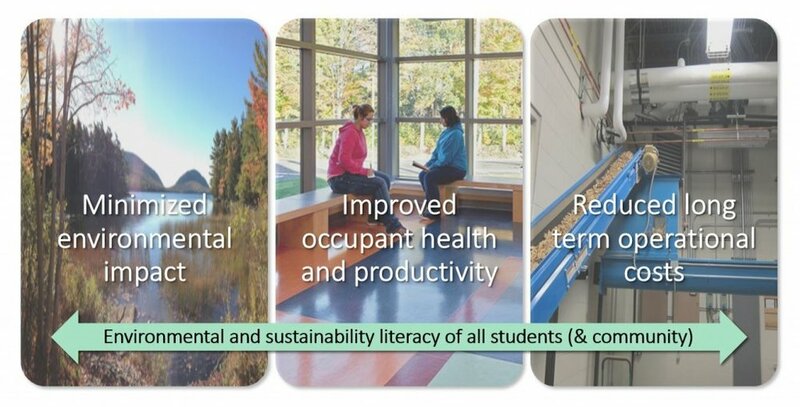 The design, construction, and operations of a green school are based on long term, life cycle costs that result in minimized environmental impact, improved occupant health and productivity, and reduced long term operational costs. 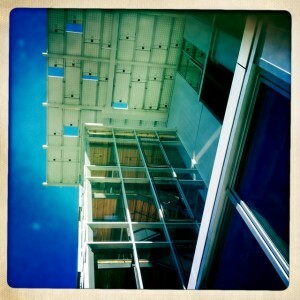 How do we design a green school?… With an integrative design process. An integrative process encourages project teams to identify shared goals early in the design process, analyze synergies between all parts of the project, and explore multiple strategies to meet project performance goals. The process embeds the value and meaning of sustainability into how we work on our projects. What this means for our work in simple terms is that we frontload the design process. • We holistically understand the existing context. • We set shared goals with the owner prior to design. • We bring all team members to the table early in the design process. • Applying systems thinking, we set up feedback loops and other collaborative procedures to optimize all the decisions we make. We will take the conversations from each of the green schools presentations and begin to prioritize unique sustainability goals for each project. We will carry those goals throughout each project - weighing our options, considering life cycle costs, looking at synergies between systems, and making sure both clients end up with a cost effective, healthy, and environmentally friendly building that can truly enhance productivity and make education enjoyable and rewarding. Pam Anderson, Joan Klein, Suzanne Morin, and Allison Zuchman of PDT attended the Healthy Materials Summit in Boston in November. The Healthy Materials Summit, the first to be held in New England, was a giant leap in broadening the dialogue about making a greater positive impact when choosing building materials and products. By requiring full disclosure and transparency of material composition for each product that goes into our buildings, we can challenge manufacturers, designers, specifiers, and end-users to make informed decisions not only about the environmental qualities of materials but also about how materials we choose impact human health and comfort. At the Summit, industry leaders Nadav Malin (BuildingGreen), Bill Walsh (Healthy Buildings Network), Denis Darragh (Forbo Flooring Systems), Tracey Powel (ASSA ABLOY), Heather Henriksen (Harvard Office for Sustainability), and Melissa McCullough (Environmental Health & Safety, Dana-Farber Cancer Institute) spoke about where the market is now, the opportunities and challenges around driving the marketplace toward health product declarations, and the branding of their own organizations around material transparency and sustainability. Twenty years ago the industry started promoting green materials. That translated into a myriad of products with varying degrees of recycled and regional content. Toxins were addressed most commonly with low- or no-VOC products. Today a more holistic approach is needed to also address life-cycle costs and the health impact of materials. EPD’s (environmental product declarations) and HPD’s (health product declarations) are two tools being adopted by the industry that move us in that direction. An EPD is a summary of the environmental characteristics of a product based on its life-cycle assessment. The life-cycle assessment is based on information from sourcing and transportation of raw materials, to product installation, durability and maintenance, all the way to repurposing, recycling or disposing of the material at the end of its life. A health product declaration (HPD), the focus of the Summit, is a nutrition label for a building product. A HPD reports a product’s contents and each ingredient’s relationship to the bigger picture of human and ecological health. A HPD increases transparency by disclosing ingredients and their potential health hazards and reduces redundancy by referencing existing hazard lists, EPD’s and other information that is available industry-wide. Unlike the EPD, the HPD has a standard, fixed reporting format which creates consistency, makes clear which information is reported and which is not, and is free to use. The AIA (American Institute of Architects) recently released two resources around their design and health initiative: the AIA Design and Health Research Consortium initiative and the document Design & Health Topics. The AIA Foundation, the American Institute of Architects (AIA), and Association of Collegiate Schools of Architecture is establishing the AIA Design & Health Research Consortium to advance revolutionary, university-led research in the area of design and health. The consortium will be comprised of teams of experts in architecture and public health. For more information and to join the consortium (submissions Due October 15th), click here. Design & Health Topics is a document developed by the AIA's Design and Health Leadership Group, made up of nationally recognized public health officials, planners and architects in the field, to describe the scope of the architect’s role in design and health. This document outlines a framework for enhancing the health and well-being of all populations through built environment design and policy. The World Health Organization constitution (1946) defined health as “a state of complete physical, mental and social well-being and not merely the absence of disease or infirmity.” Well-being includes social connectedness, spiritual fulfillment, life satisfaction, and happiness. These conditions depend in part upon health, and in turn contribute to health. The built environment has an important impact on health and well-being. However, these links to health—compounded by unique cultural, demographic and geographic considerations—often extend beyond the workaday practices and vocabularies of design professionals. The nature of all things is cooperation. We reorganize ourselves almost daily. Are you a backpacker or an urban condo dweller? The last two quotes are the most compelling, and curious. Too much uncertainty creates instability. Develop a shared baseline of knowledge. Are you a backpacker or an urban condo-dweller? What is the tool of choice for a backpacker? A Swiss Army knife. A Swiss Army knife is a tool that does a lot of things fairly well to complete simple tasks, but does not do any one detailed task exceptionally. An urban condo dweller, on the other hand, has many specialized tools (a food processor, a coffee machine, a garlic press) to complete specialized tasks. How does this relate to sustainable design? Use the right tool at the right time. During concept design analysis we use simple box models to compare various solutions. We study big-picture concepts to determine good/better/best scenarios. We compare a variety of scenarios quickly using simple tools to set the direction of the project. We are all backpackers in concept design. Farther along in the design process, once we have narrowed our choices to the best solutions, we start to dig deeper with more specialized tools. We are urban condo dwellers at this point—we forgo the Swiss Army knife and use specific tools to study certain technical concepts very well. This is an important distinction. If we jump ahead to the specifics without setting goals, comparing big-picture strategies, or looking at system synergies, we are likely to miss opportunities. What are the Owner’s and the team’s values and intentions for the project? Have project goals and team processes been clearly stated to all team members? Is the project team comparing various options before jumping ahead to the details? Are team members using the right tools at the right time? That sets us all off to a good start. P.S. If you are in Seattle, it is worth your time to check out Islandwood (outdoor learning center) on Bainbridge Island and the Bullitt Center (net-zero, Living Building Challenge) in downtown Seattle. Kuniholm also noted that reducing demand is key to reduce Maine’s fossil fuel consumption and power usage in general. Maine’s first school of architecture at the University of Maine at Augusta and the Maine Uniform Building and Energy Code are essential resources in educating and setting standards for demand and emissions reductions. Kuniholm invited the attendees to visit Architecture 2030, an initiative started by noted architect Ed Mazria, to learn more about how architects are at the forefront of reducing greenhouse gas emissions. Bob Perciaseppe, deputy administrator of the EPA, pointed out that the government does regulate a range of unhealthy chemicals but until now has done nothing to regulate carbon. He congratulated Maine on its efforts to date and reminded us that our air, water, farms, and forests are affected daily by power plant emissions drifting east. Economist Charles Colgan of USM debunked the notion that capping power plant emissions would harm the economy, though he noted that electric bills might rise in some parts of the country in the short term. He cited a January 2014 report by the Maine Department of Environmental Protection indicating that Maine’s GDP did not decline as a result of the drop in emissions after 2005. The Maine Public Broadcasting Network is likely to run a segment of Friday’s event on Speaking in Maine in the coming weeks. June 17th Update: Portland council adopts fee for bags, bans foam containers (Portland Press Herald) Portland city councilors voted late Monday night to charge consumers a nickel for every disposable shopping bag they get and to ban foam containers for food and beverages in an effort to reduce trash that pollutes waterways. Both ordinances are effective April 15, 2015. Portland’s disposable bag fee and foam packaging ban ordinances will be up for a vote by the City Council this Monday, June 16th beginning at 7pm. Supporting these ordinances will encourage people to use reusable bags and eco-friendly packaging, and will help clean up Portland’s neighborhoods, streets, and Casco Bay. Summary of Bag Fee Ordinance: All supermarkets, grocery, convenience and drug stores are prohibited from distributing single use disposable carryout bags (paper or plastic) to customers, but they are permitted to sell these bags for a minimum fee of 5 cents. If you are a Portland resident and cannot attend the City Council meeting in person, you can testify by calling or emailing the city councilors. NRCM (Natural Resources Council of Maine): Five Cents for a Disposable Bag? No Thanks, I’ve Brought My Own! Alan Kuniholm, PDT Principal and Portland Society for Architecture's President, is participating in events this week that are part of the Urban Land Institute (ULI) Advisory Service visit to Maine. ULI is here to advise Portland and South Portland on urban design and development practices that are more resilient and adaptable to the impact of climate change. WASHINGTON (May 8, 2014) – A group of nationally renowned land use and urban planning experts has been convened by the Urban Land Institute (ULI) to make recommendations to the cities of Portland and South Portland on developing strategies for a resilient waterfront. Conducted through ULI’s advisory services program, the panel, which will be visiting the cities May 11-16, will be evaluating many aspects of waterfront resilience, including the impact of sea level rise and storm surge on real estate values and infrastructure systems. The ULI panel’s recommendations will be presented at 8:30 a.m. on Friday, May 16th, at the Jewett Auditorium on the campus of Southern Maine Community College. The event is open to the public. Healthcare Principal Ann Fisher introduces Walt Vernon, principal and CEO of Mazzetti. Vernon spoke on "Sustainability Initiatives in Healthcare." Walt Vernon, principal & CEO of Mazzetti, based in San Francisco, California, visited PDT last Friday to give a presentation "Sustainability Initiatives in Healthcare" to the Maine Healthcare Engineers' Society (MEHES) focused on the FGI white paper "Sustainable Design Guidelines for Hospitals and Outpatient Facilities", the ASHE Sustainability Roadmap, and the Energy Efficiency Challenge (E2C). Vernon's talk centered around the ASHE Sustainability Roadmap and E2C. Materials consumption in health care facilities costs health care consumers $10 billion annually in waste disposal costs. 80 percent of this waste is no different from that generated by a hotel, up to 60 percent of which is either recyclable or compostable. A standard recycling program in a hospital can reduce waste by 30–40 percent. A hospital uses an average of 139,214 gallons of water per day. Water conservation can be achieved by using less waste through better technologies in systems and fixtures and by capturing rainwater and other “used” water for other purposes. Hospitals consume 2.5 times more energy than other commercial buildings, spending more than $8.7 billion per year according to the EPA Energy Star program. This white paper provides baseline requirements for the building site, energy use, indoor environmental quality, water supply, emissions and pollutant controls, materials and resources, and waste reduction. Additional performance and prescriptive requirements are also listed for facilities desiring to reach above and beyond the baseline minimums. Participating facilities begin by benchmarking their buildings using Energy Star Portfolio Manager and work to implement low- and no-cost energy efficiency improvements that can reduce energy consumption by at least 10 percent. E2C provides participants with real data, proven strategies, financial tools, local success stories, and fundamental concepts for saving energy. At the Maine Hospital Association (MHA) Conference in February in Newry, Maine, PDT designer Joan Klein attended educational sessions about how the lean process can help transform healthcare. Lean Specialist Mark Graban, along with representatives from various hospitals, spoke about what lean is and how it is helping improve their working environment. According to Graban, lean is a technique that grew out of Toyota’s business model in the 1980s to increase customer value by maximizing the flow of products and services. The process begins by identifying the value of a product or process and then identifying the steps needed to create that value. Lean looks at the whole organization as a system and looks at all the steps individuals are taking to solve a problem. At the MHA conference, John Comis of Redington-Fairview General Hospital talked about how the hospital staff used the lean process to improve patient wait time in the emergency room. The average wait time was almost three hours. The original proposed solution was to add more exam rooms. The hospital staff decided to step back and think in a lean way to assess the problem. They analyzed a patient flow diagram (see spaghetti diagram above), which showed that patients were seeing a nurse, a physician, and the head RN in three different locations, and giving their information several times before being given a diagnosis and being treated. They were able to simplify the flow so that the patient gives the information only once to the physician and RN, who are in the same room (spaghetti diagram solved). The waiting time for patients was reduced to less than 1 hour without adding any additional rooms.